Recently I was asked if I would be interested in reviewing the book "Harris Tweed Appliqué" by Chris Hammacott. I adore appliqué so naturally I said I would love to. I received a copy of the ebook and I have found that to be even better in many ways than a paper book because there are very helpful instructional videos embedded in the book as well as links to YouTube videos. The table of contents is interactive so you can just click on a chapter you want to go to and you are immediately taken there in the book. There are also links to sources to buy 'Harris Tweed' online as well. You can print out the templates for your projects from the templates section in the ebook and throughout the book there are also links to references in other parts of the book. By clicking that link you are taken to the reference (no more flipping through pages searching!) In short, I have found the ebook to be quite a time saver! The beginning of the book contains an introduction which gives some history of 'Harris Tweed' and the area of Scotland in which it is made - The Isle of Harris, linked to the Isle of Lewis. 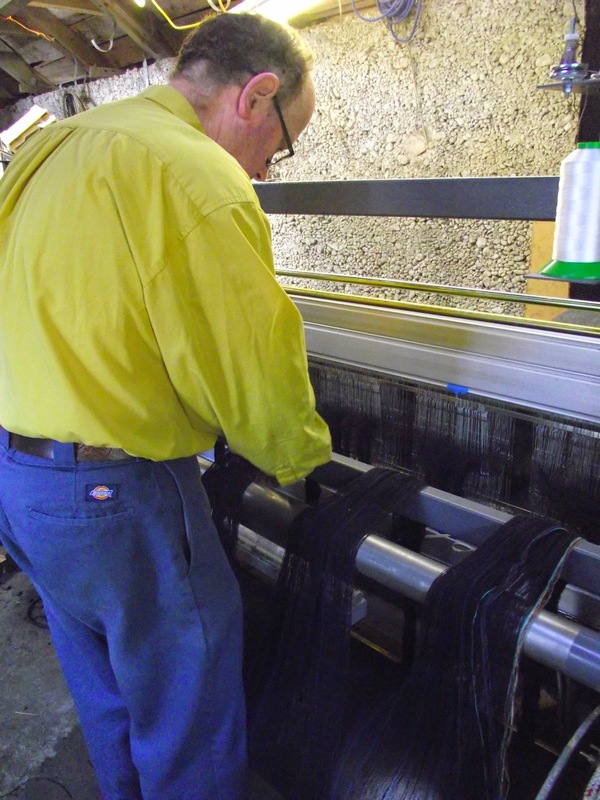 Readers learn a bit about how the cloth is woven. This part was very interesting to me for two reasons. One reason being that my maternal Grandfather's parents came to Canada from Scotland. His name was Alexander Weir and I could see him wearing garments made of 'Harris Tweed'. In fact, he was a businessman and I'm sure he must have owned some. The second is because when I was a child I received a toy loom complete with shuttles and I used to enjoy weaving very much as a child. To see photos of real and true weavers working at their craft and to learn how the cloth is made is fascinating. My daughter would love this beautiful cushion for her room. 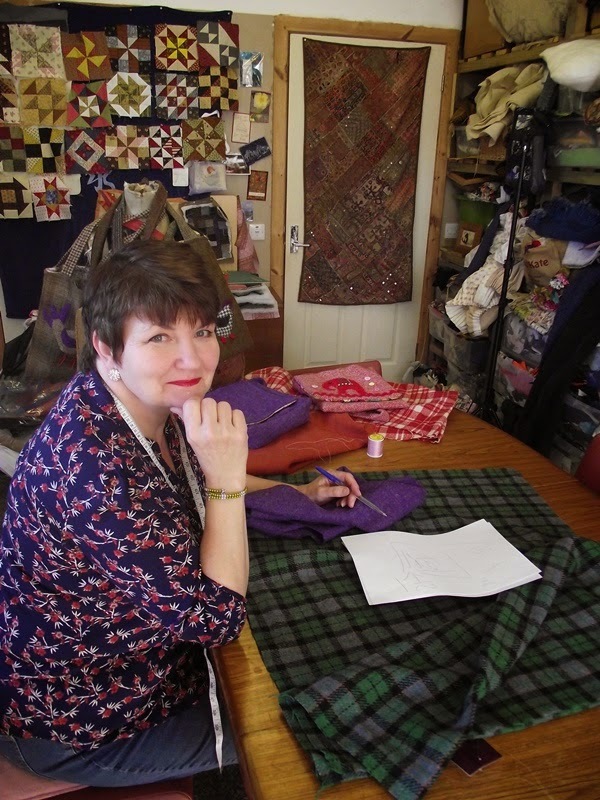 Harris Tweed Appliqué is suitable for both beginners and experienced quilters. To achieve the full effect of the projects I feel it is best to use 'Harris Tweed' to create them. There are links in the book to fabric sources and I also found some sources on Etsy as well. If one were fortunate enough to own quite a bit of this luxurious cloth I think a lap quilt made with it would be the cosiest blanket in the house for winter time. I was thinking that several of the projects could be put together as a sampler for such a quilt. The great thing about Harris Tweed Appliqué though is that the projects are all manageable and of a small enough size that a quilter/sewist does not need a large quantity of 'Harris Tweed' to make them. I love this wall hanging and the yo-yos on the border. This is the perfect project for this time of year (in Canada at least) when it is cold and the last thing you want to do is go outside. Cuddling up on the sofa with a hand quilting project like this and a hot drink is just the thing to do! When I lived in New Brunswick a few years ago I found that 'Primitive' crafting is very popular there and people enjoy decorating their homes both inside and out with this style. The projects in the book could easily be adapted to the 'Primitive Craft' style by their rustic nature, especially those that use raw edge appliqué. I have a dear friend who has two pugs and when I saw the "Pearl the Pug" cushion I knew right away that is the first project I want to make from this book. I plan to order some 'Harris Tweed', hopefully by the end of the month, and get sewing on this to have it done for Christmas. I will share photos on the blog when I have it finished. 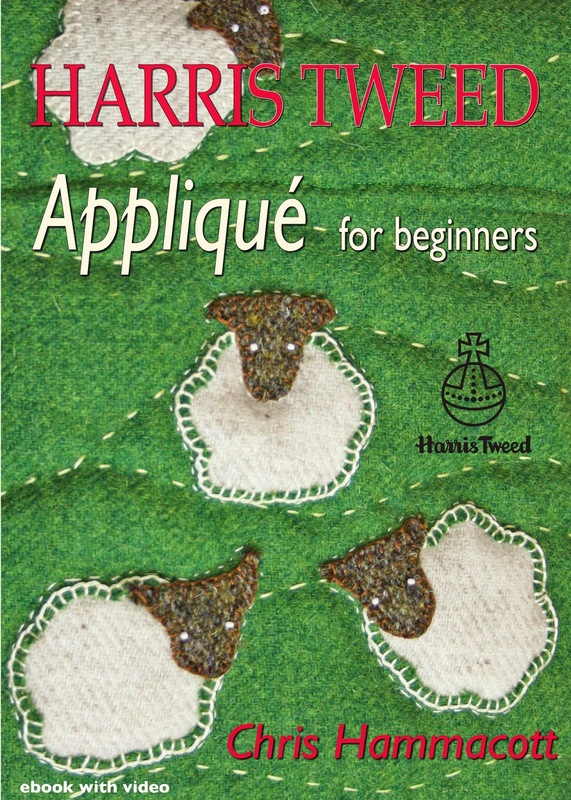 The author of Harris Tweed Appliqué gives you all the instructions you need to sew the projects in the book even if you are a beginner. As Chris Hammacott writes, "As long as you can thread a needle, this ebook is for you." If you choose to buy this book I hope you will enjoy it as much as I have. My mother is a tea enthusiast so a tea cosy is a perfect gift to sew for her and her many tea pots! Here is the book's author Chris Hammacott at her desk. 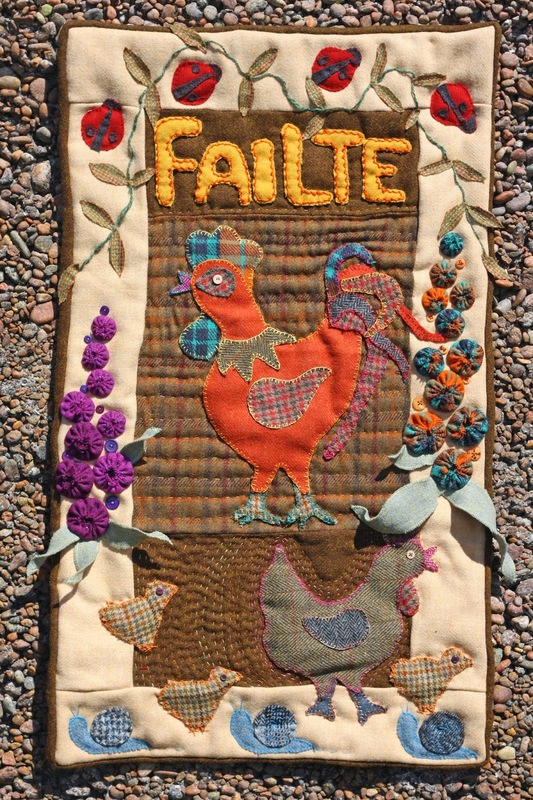 Thank you for visiting my blog and learning about Harris Tweed Appliqué with me. Disclosure: I was provided with a free copy of the ebook for my review but my thoughts and opinions written in this post are my own and were not influenced in any way. The links in this post are affiliate links meaning that if you click on the links and choose to purchase this book I will receive a small commission.